DJ Fresh speaks about making a career out of something you love. He’s driven, passionate about radio and a likeable guy. By Kim Maxwell. Photos by Jo Spies. 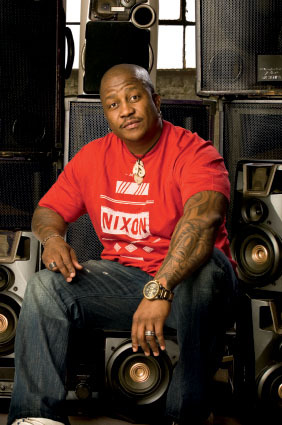 If you’re a radio listener in South Africa, DJ Fresh of 5FM epitomizes cool. He greets call-in listeners with a perky ‘Five, hi’ and has an addictive throaty laugh while keeping his audience entertained and in conversation on their journeys home. Fresh hosts ‘The Drive Time’ on weekdays during the 4pm to 7pm time slot, and ‘The Power Night’ on Wednesday evenings. His trendy music, comedy inserts and chitchat appeals to 5FM’s core listeners, the under 25s. They have a cross-genre of musical tastes, are technologically savvy, fashion-forward and positive about South Africa’s future. Much like Fresh for that matter. Thato Sikwane is DJ Fresh, a disc jockey born and raised in Gaborone, Botswana. He moved to South Africa in 1994 to study, and 17 years later he’s a household name. Radio broadcasting is a family occupation, because Fresh met his wife Thabiso Sikwane on the job – she was reading news on his show when they both worked for YFM. Today Thabiso hosts a talk show on Kaya FM. 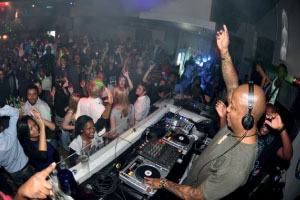 Like many radio deejays, Fresh loved music as a teen and laid the groundwork for his future career by spinning the decks at social events for his peers. Gaining experience while doing what you love is a very good career strategy. ‘At 13 I started deejaying at one of the socials at boarding school in Botswana. They needed a DJ at short notice and the entertainment officer at the school knew I collected music,’ he explains. Fresh secured his first radio show in Botswana at age 18. In South Africa Fresh developed a following for his breakfast slot on YFM, joining the broadcaster in 1997 and hosting a show for eight years. His fan club has expanded further during his past five years at 5FM. He won both ‘best daytime’ presenter and ‘best night-time’ presenter at the 2011 MTN Radio Awards. Business ventures on the side keep him busy too – he’s released 25 house music albums to date, has shared the DJ booth with a number of international artists, and is a sought-after personality for promotional events and music gigs in clubs around South Africa. He manages all this work through his own production company Big Dawg Productions. A music career wouldn’t have happened if Fresh had followed his original career path. One of his many dreams growing up was to be a high-powered lawyer. Conveniently, this overlapped with his father’s aspirations. ‘The thing is, music was a hobby that was happening already. So by the time I got into law school at the University of Botswana, I’d already been on radio as a deejay. In my first year I lost interest in law quickly,’ he says. Ultimately radio won out. ‘I spent one year trying to study and stay interested, at the same time doing gigs on the sly because my dad wanted me to be a lawyer. He insisted I repeat my first year, so the only way out was to ensure I failed so badly that they kicked me out! So basically my second year of “studying” was literally spent in my room playing TV games and videos. The only class I attended was political science ‘cause I love politics’. ‘The radio station was giving me more and more time on air, which didn’t help my dad’s cause,’ he continues. ‘And it was decent money for a 19 year-old so I wasn’t complaining.’ He signed up for a Media Studies diploma at Boston Media House in Johannesburg, majoring in journalism and advertising. ‘When I told my dad I’d been accepted he wanted to know how he could be sure I wouldn’t fail this too,’ laughs Fresh. ‘But I graduated eventually. In my third year YFM radio had started up and I began working there. I completed my diploma exams but took my time with the dissertations.’ Fresh remains interested in law, and wouldn’t mind finishing his legal degree at some point. So is studying necessary for a radio deejay? Not necessarily. ‘For radio generally you either have a knack or you don’t. Much as you can train a good broadcaster, Idon’t think any degree will guarantee that you will be a good one,’ says Fresh. Yet good communication skills are crucial. ‘Depending on the type of radio format you want to work in, being able to express yourself is very important,’ says Fresh. He recommends that aspirant deejays join the debating club or take drama classes to practice public speaking and build confidence. Specialised music knowledge isn’t essential. ‘What is important is having the passion and drive to make it work in the first place, else those degrees won’t help much,’ he adds. Fresh is refreshingly grounded, and genuinely connected with the wider community that listens to him. ‘If as a listener you’re touched by something, then our job is done,’ he says. Through the DJ Fresh Foundation, he’s actively involved in educating a few deserving young people – previously disadvantaged kids are prioritised. They are enrolled annually in post-matric study scholarships at Boston Media House, Rosebank College or Monash South Africa. ‘The challenge in radio is to respect the power of the media. For a lot of radio deejays, once they’re in there, they forget it’s a powerful tool that can be an instrument of change. We need to maximise the good we can do,’ he smiles. ✱ I’m a family man with a daughter aged 17 from a previous relationship. I also have a son of nine and a three-year-old daughter with my wife Thabiso. ✱ I’m a sucker for lamb chops. It doesn’t matter where on the planet I am, it’s the first thing I’ll check for on the menu! ✱ As with any trip, it’s the destination that counts because otherwise you won’t know when you’ve arrived. ✱ I played a lot of sport in high school – soccer, basketball, tennis, table tennis and baseball. It gave me some sort of gym ethic. ✱ I won’t lie: every weekend for the last 15 years I’ve had gigs. Some weekends I’m literally doing eight gigs – the last few weekends were like that. So it gets that crazy, but in time you can control how busy you get. ✱ I collect movies and TV series. But thanks to my iPad I can carry books and movies and get the best of both worlds. ✱ Sometimes after a heavy weekend of burning the candle at both ends my larynx has taken a beating. I’ve had tonsillitis, laryngitis, you name it.